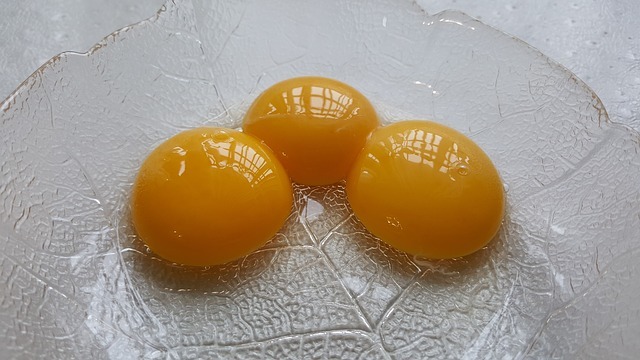 A lot of people acknowledge egg yolk as an edible part of an egg, some also know that it is used as an ingredient in making face mask and for strengthening hair. People now incorporate egg yolks and whites in their hair mixture regimen, mostly when preparing Deep Conditioner, Hair Protein Treatment, these are used to restore dry and damage hair. ■ Egg Yolks helps to stimulate quality Hair Growth and repairs dry damaged hair. The Protein element in egg yolk adds shine to your hair, makes your hair soft, and the lecithin found in egg helps to moisturize our hair. ■ Egg yolks are packed with nutrients that helps to enrich the hair with fat-soluble vitamins and protein, that helps us to achieve healthy hair. ■ Egg yolk promotes hair growth with help of it sulfur content. When you apply egg yolk mixture to your hair, It enables stimulation of the scalp and nourish your hair roots. Mix the egg yolk and lemon juice together by beating it or whisking until frothy, section your freshly washed hair and apply on it. Make sure that you worked all areas to for maximum coverage, cover with shower cap and leave to set for 30 minutes. Rinse off with cold water, do not use hot water or else you will have cooked egg yolk on your hair. Make sure to rinse your thoroughly as to get all eggs off your hair, you can use conditioner to rinse out your hair very well, dry your hair and style. Can you share what you have used and what works for you??? Will love to read them. such specific about my problem. You're amazing! Minimal 20 musically followers per account.